This is an interesting variation of the classic. Packed with all the same cholesterol busting benefits of the original. Bring water to a boil. Add oats. Turn down to medium-low heat and let cook until done, about 15-20 minutes. Stir in sugar, and cinnamon while oats are still warm. Let cool to room temperature, about 20 minutes. 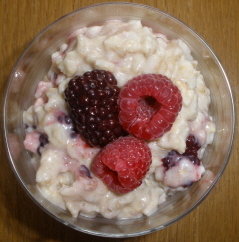 Stir in yogurt, and gently fold in berries, let chill in refrigerator for at least 30 minutes. If you use frozen fruit, there will be more juice which will turn the oatmeal pink. The berries I used for this were blackberry and raspberry. Want some more fun? Add almonds, banana, whatever you like! Oatmeal is like a pizza crust. It can handle whatever you throw at it.